A refracting telescope (also called a refractor) is a type of optical telescope that uses a lens as its objective to form an image (also referred to a dioptric telescope). The refracting telescope design was originally used in spy glasses and astronomical telescopes but is also used for long focus camera lenses. Although large refracting telescopes were very popular in the second half of the 19th century, for most research purposes the refracting telescope has been superseded by the reflecting telescope which allows larger apertures. A refractor's magnification is calculated by dividing the focal length of the objective lens by that of the eyepiece. All refracting telescopes use the same principles. The combination of an objective lens 1 and some type of eyepiece 2 is used to gather more light than the human eye is able to collect on its own, focus it 5, and present the viewer with a brighter, clearer, and magnified virtual image 6. The objective in a refracting telescope refracts or bends light. This refraction causes parallel light rays to converge at a focal point; while those not parallel converge upon a focal plane. The telescope converts a bundle of parallel rays to make an angle α, with the optical axis to a second parallel bundle with angle β. The ratio β/α is called the angular magnification. It equals the ratio between the retinal image sizes obtained with and without the telescope. Refracting telescopes can come in many different configurations to correct for image orientation and types of aberration. Because the image was formed by the bending of light, or refraction, these telescopes are called refracting telescopes or refractors. The design Galileo Galilei used in 1609 is commonly called a Galilean telescope. It used a convergent (plano-convex) objective lens and a divergent (plano-concave) eyepiece lens (Galileo, 1610). A Galilean telescope, because the design has no intermediary focus, results in a non-inverted and upright image. Galileo's best telescope magnified objects about 30 times. Because of flaws in its design, such as the shape of the lens and the narrow field of view, the images were blurry and distorted. Despite these flaws, the telescope was still good enough for Galileo to explore the sky. The Galilean telescope could view the phases of Venus, and was able to see craters on the Moon and four moons orbiting Jupiter. Parallel rays of light from a distant object (y) would be brought to a focus in the focal plane of the objective lens (F′ L1 / y′). The (diverging) eyepiece (L2) lens intercepts these rays and renders them parallel once more. Non-parallel rays of light from the object traveling at an angle α1 to the optical axis travel at a larger angle (α2 > α1) after they passed through the eyepiece. This leads to an increase in the apparent angular size and is responsible for the perceived magnification. The final image (y″) is a virtual image, located at infinity and is the same way up as the object. 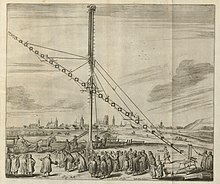 Woodcut illustration of a 46 m (150 ft) focal length Keplerian astronomical refracting telescope built by Johannes Hevelius. The Keplerian telescope, invented by Johannes Kepler in 1611, is an improvement on Galileo's design. It uses a convex lens as the eyepiece instead of Galileo's concave one. The advantage of this arrangement is that the rays of light emerging from the eyepiece are converging. This allows for a much wider field of view and greater eye relief, but the image for the viewer is inverted. Considerably higher magnifications can be reached with this design, but to overcome aberrations the simple objective lens needs to have a very high f-ratio (Johannes Hevelius built one with a 46-metre (150 ft) focal length, and even longer tubeless "aerial telescopes" were constructed). The design also allows for use of a micrometer at the focal plane (used to determine the angular size and/or distance between objects observed). The achromatic refracting lens was invented in 1733 by an English barrister named Chester Moore Hall, although it was independently invented and patented by John Dollond around 1758. The design overcame the need for very long focal lengths in refracting telescopes by using an objective made of two pieces of glass with different dispersion, 'crown' and 'flint glass', to limit the effects of chromatic and spherical aberration. Each side of each piece is ground and polished, and then the two pieces are assembled together. Achromatic lenses are corrected to bring two wavelengths (typically red and blue) into focus in the same plane. The era of the 'great refractors' in the 19th century saw large achromatic lenses culminating with the largest achromatic refractor ever built, the Great Paris Exhibition Telescope of 1900. Apochromatic refractors have objectives built with special, extra-low dispersion materials. They are designed to bring three wavelengths (typically red, green, and blue) into focus in the same plane. The residual color error (tertiary spectrum) can be up to an order of magnitude less than that of an achromatic lens. Such telescopes contain elements of fluorite or special, extra-low dispersion (ED) glass in the objective and produce a very crisp image that is virtually free of chromatic aberration. Due to the special materials needed in the fabrication, apochromatic refractors are usually more expensive than telescopes of other types with a comparable aperture. Refractors suffer from residual chromatic and spherical aberration. This affects shorter focal ratios more than longer ones. A 100 mm (4 in) f/6 achromatic refractor is likely to show considerable color fringing (generally a purple halo around bright objects). A 100 mm (4 in) f/16 has little color fringing. In very large apertures, there is also a problem of lens sagging, a result of gravity deforming glass. Since a lens can only be held in place by its edge, the center of a large lens sags due to gravity, distorting the images it produces. The largest practical lens size in a refracting telescope is around 1 meter (39 in). There is a further problem of glass defects, striae or small air bubbles trapped within the glass. In addition, glass is opaque to certain wavelengths, and even visible light is dimmed by reflection and absorption when it crosses the air-glass interfaces and passes through the glass itself. Most of these problems are avoided or diminished in reflecting telescopes, which can be made in far larger apertures and which have all but replaced refractors for astronomical research. A list of the largest refracting telescopes over 60 cm (24 in) diameter. John Wall Telescope a 30" f12 refractor, the largest ever built by an individual maker (John Wall, inventor of the Crayford focuser). It is the equal fifth largest in the world with that at the Paris Observatory. It is now operated by the Hanwell Astronomical Society. ^ "Telescope Calculations". Northern Stars. Retrieved 2013-12-20. ^ "The First Telescopes". American Institute of Physics. Retrieved 15 July 2015. ^ CTI Reviews (2016). Physics for Scientists and Engineers, Refractors were the earliest type of optical telescope. Raymond A. Serway. p. 649. ISBN 978-1-61906-918-3. ^ Sidereus Nuncius or The Sidereal Messenger, 1610, Galileo Galilei et al., 1989, pg. 37, The University of Chicago Press, Albert van Helden tr., (History Dept. Rice University, Houston, TX), ISBN 0-226-27903-0. ^ Hevelius, Johannes (1673). Machina Coelestis. First Part. Auctor. ^ Tunnacliffe, AH; Hirst JG (1996). Optics. Kent, England. pp. 233–7. ISBN 978-0-900099-15-1. ^ "Starizona's Guide to CCD Imaging". Starizona.com. Retrieved 17 October 2013. ^ Stan Gibilisco (2002). Physics Demystified. Mcgraw-hill. p. 532. ISBN 978-0-07-138201-4. ^ "John Wall refractor - Hanwell Community Observatory". www.hanwellobservatory.org.uk. Wikimedia Commons has media related to Refracting telescopes.